Mutual funds are an attractive low-cost diversification option for investors. Given the plethora of schemes floating in the Indian mutual fund industry, investors look at different performance measures and ratings, put in promotional use by the mutual fund houses, to make their investment decision. Do such promotional strategies offer the best possible guidance to investors? The competitive landscape of the mutual fund (MF) industry has undergone a tremendous change in the past few years. MFs compete with one another either by satisfying different economic functions or by configuring the activities in the value chain so as to produce a low-cost or a differentiated product. Differentiation strategies have been more varied, with firms setting themselves apart along at least three dimensions1: fund performance, marketing efforts and new product development. Earlier studies (Morningstar2) carried out on the effect of fund performance on the inflows of new money into the fund have shown that top-performing funds receive net inflows of new money, yet funds that perform poorly do not lose many assets. If this is the case, then what are the ratings/benchmarks that investors look at before investing? A high correlation between the rating and the subsequent cash inflow into the fund is one such standard that investors consider and such ratings are what MF houses would want to use for promoting their schemes. Having invested the money based on such ratings, can the investors expect relatively better returns in the future? This article attempts to answer that question by comparing the funds' performance in the out-of-sample period (different period) with the in-the-sample period (sample data period) ratings. The following section gives a brief introduction of Indian MF industry to help the reader form a perspective on the analysis presented in this article. The performance of mutual funds (MFs) in India was initially, not even close to satisfactory levels. But 24 million shareholders got accustomed to MFs with guaranteed high returns by the beginning of liberalization era in 1992. The credible past record of the MFs operating up until that point of time (primarily UTI) became a marketing tool for new entrants. The investors expected sky high returns while at the same time they were unprepared for absorbing the risks resulting as a consequence of the post liberalization India Inc. The net asset value (NAV) of mutual funds in India declined when stock prices started falling in the year 1992. Those days, the market regulations did not allow portfolio shifts into alternative investments. There was no choice apart from holding the cash or to continue investing in shares. Moreover, since only closed-end funds were floated in the market then, the investors had to disinvest by selling at a loss in the secondary market. The 1992 stock market scandal that led to losses due to disinvestments and the lack of transparent rules in the fledgling business environment rocked investors' confidences. The MF industry in India today has come a long way in offering a wide variety of products, backed by stringent monitoring. The number of funds operating in the country and the schemes offered by them have increased manifold. The MFs not only serve as a savings scheme but also offer several investment objectives to prospective investors. Deregulation of the sector, allowing up to 100% FDI has permitted the industry to grow rapidly (Exhibit 1). However, the regulator has treaded deregulation with caution by mandating minimum capitalization requirements for risk minimization and ensuring long term commitment. At the same time, private sector players have rapidly garnered market share, eating into UTI's share of the pie. The pictorial representation in Exhibit 2 gives us an overview of the major industry players. Conscious of the competition from the large number of fund houses and an even larger number of schemes operative in India, MF houses have strived to differentiate along the performance dimension. Several performance measures are looked at by the investors to evaluate the superiority of a fund. More than these measures, retail investors often base their investment decision on performance ratings (ICRA/CRISIL) as they provide easy guidance to a superior fund. Therefore, for MF houses it becomes important to identify the influential ratings and use it in promoting their funds. To prevent the erosion of investor confidence, it is also important that these ratings provide a certain degree of guidance regarding the fund's future performance. Given that the significance of these ratings has been established, a couple of questions spring to one's mind. How can an investor analyse the influence of performance ratings on cash inflow to assess the suitability of the promotional strategies adopted by mutual funds? Secondly, can one rely on the predictive power of such performance ratings? The rest of the article attempts to answer these questions and measure the effectiveness of the strategy adopted by retail investors in basing their investment decisions on performance ratings. Before presenting the findings of the study, the basis for data selection for the analysis has been presented in the following section. The arguments presented in this article have been based on secondary data that was limited to the choice of mutual fund schemes, tenure and performance ratings. Only Growth equity schemes were selected for the study because they represent the largest volume of funds transacted in India and hence the analysis is likely to reflect the average investor's choice. Moreover, several studies have shown that the performance predictability may be due to the style of fund rather than the skill. Therefore, it is necessary to stick to only one investment objective. January'04 to December'07 was selected as the appropriate time window for the analysis because the data availability was lean before January'04 and ending Assets Under Management (AUM) were unavailable after December'07 at the time of this article was written. ICRA rating of MF schemes was selected as the performance rating on which the investors are expected to base their investment decision. This was because ICRA ratings perform a similar role in India to Morningstar ratings in US or Lipper ratings in Europe and Indian MFs use the ICRA ratings to promote their funds. In the US, Morningstar ratings have been proved to have a remarkably high influence on cash inflows into various schemes4. In India, ICRA being a leading independent credit rating agency gives it further credibility to its ratings. A thorough correlation analysis establishes the role played by the ICRA rating in influencing investors' investment decision. The effect of ICRA rating on the cash inflow was isolated in order to assess whether MF houses are justified in using this rating for promotion. With quarterly cash inflow as the dependent variable, the correlation analysis was first carried out with the beginning assets under management (AUM) of the scheme as the independent variable and then with the product of beginning AUM and ICRA rating as the independent variable. It is to be noted that the cash inflows into a scheme can be explained by a rating only until the period for which the ratings are valid and therefore quarterly cash flows were considered as the dependent variable. Moreover, the correlation analysis has been carried out in two steps in order to identify the incremental effect of ICRA rating on cash inflows. A pictorial representation of the analyses carried out is shown in Exhibit 3. A sample of the data set considered is presented in Exhibit 4. After obtaining tabulating the data, the correlations were calculated. It was found that in the first case when cash inflows were regressed against the initial corpus size, the quantum of future cash inflows was heavily correlated to the starting AUM, in this case to a degree of approximately 40%. The degree of correlation increased in the second scenario where the product of ICRA ratings and the corpus size was used to nearly 50%. Thus, these ratings do appear to play an important role in shaping investor decisions and hence, it is necessary to examine to what extent is this investor confidence justified. The predictive power of ratings was measured by comparing the funds' performance in the out-of-sample period with the in-the-sample period ratings. Historical fund ratings, performance measures and naive predictors were used as regression model variables. The 3-year out-of-sample performance measured using different measures was regressed separately against the previous years' rating and naive predictor measure. The analysis methodology is shown in Exhibit 5. The performance measures employed were Sharpe's ratio, Jenson's Alpha and 4-index alpha. Based on the data collected on Adjusted NAVs of schemes, risk free rate, Sensex, Nifty, BSE 200 and BSE small cap, the performance in the out-of-sample period was computed for each scheme using these three measures. The historical fund rating of the schemes was included as an independent dummy variable (4 in number with Rating 1 as the base level). In order to assess the incremental advantage offered by the sophisticated ICRA ratings, a naive predictor was also constructed as the mean of average excess returns over the past 12 months before the ratings were published. This variable was used as an independent variable in three separate regressions with each of the three performance measures as the dependent variable. The regression results have been summarized in Exhibit 6. From the regression results, it can be inferred that ICRA ratings have little predictive power in terms of future fund performance. Although these ratings were not meant to be predictors of future performance, it is important to realize this distinction for they significantly influence investment decisions. The naive predictor, on the other hand fares much better as compared to the sophisticated ratings in terms of predicting future fund performance. 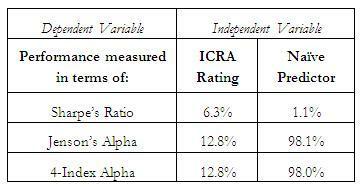 High explanation of variance for the Jenson's alpha and 4-index alpha signify that investors might have been better off basing their investment decisions on this predictor alone instead of the ICRA ratings. However as a word of caution, we would like to highlight that this analysis is only valid as long as the fund manager has not rebalanced his portfolio in order to manipulate the performance measures. Secondary research5 shows that mutual fund performance measures are susceptible to manipulation. Since the fund managers' incentives are often linked to such performance measures and the cash inflows that they attract, we cannot ignore its effect on the analysis. Though, the mutual fund industry in India is currently in a nascent stage as compared to its global peers, it is attracting high amounts of investor cash flows by employing several marketing strategies, despite the very low levels of penetration. Correlation analysis of investor cash inflows suggests that while the assets under management under a particular mutual fund scheme explained the subsequent cash inflows to a great extent, the performance ratings as published by ICRA seem to have significant incremental role in influencing investors' decisions. This brings us to the conclusion that the use of ratings in promoting MF schemes is an effective strategy in use by the MF houses. Regression analysis of the predictive power of performance ratings indicated poor predictive power of ICRA ratings over the three year time horizon considered. Further predictive power analysis using a naive predictor demonstrated much better results as compared to the ICRA ratings in terms of predictive power for Jenson's Alpha and 4-index alpha. This brings us to the conclusion that the use of ICRA ratings in promoting MF schemes, though effective, might not be a sustainable strategy as it might erode investors' confidence in the long run. The mutual funds industry would be better off assessing the use of other measures/ ratings to promote their funds. As true for any analytical exercise, the accuracy and applicability of the above results is dependent on the data quality, breadth of the analysis as well as data availability. Any constraint on these can potentially have adverse impact on the output quality. Sirri, Erik R.; Tufano, Peter, 'Competition and change in the mutual fund industry', in Financial Services: Perspectives and Challenges, edited by Samuel L. Hayes III, Harvard Business School Press, 1993. Blake, Christopher R.; Morey, Matthew R., 'Morningstar ratings and mutual fund performance', Journal of financial and quantitative analysis, Vol. 35, No. 3, September 2000, pp. 451-483. Association of Mutual Funds in India, http://www.amfiindia.com/showhtml.asp?page=mfindustry, Last accessed on: December 29, 2008. The Skilled Investor, 'Do mutual fund Morningstar Ratings changes influence individual investors? ', http://www.theskilledinvestor.com/ss.item.57/do-mutual-fund-morningstar-ratings-changes-influence-individual-investors.html, Last accessed on: September 20, 2009. Goetzmann et al, 'Portfolio performance manipulation and manipulation-proof performance measures', Society for Financial Studies, Oxford University Press, Vol. 20, Issue 5, 2007, pp. 1503-1546.